Lil yummy snack on a rainy saturday – Move Over Martha, I'm Here! I find myself always eat crap on the weekends, and I need to start finding ways to make sure to eat a (mostly) well-balanced meal versus this captain crunch donut cereal, or goldfish and chips. One night this week we went to Acme to pick up some meat for dinner. Acme had these HUGE chicken wings on a BOGO sale, so I split them in half, and marinated one half for dinner that night in Wegmans Brown Sugar BBQ sauce. The other half I marinated with a sweet Chile and cumin dry rub, and just pulled out of the freezer to defrost. Hope they’re just as good as this first batch was. So anyways, I had these leftover homemade chicken wings, shells n cheese, and steamed broccoli from dinner the other night. Usually I cook leftover mac n cheese on a saute pan with some oil and a little extra cheese. It gets kinda crunch and I love it. Today, I decided to bake it in the oven and add the broccoli. 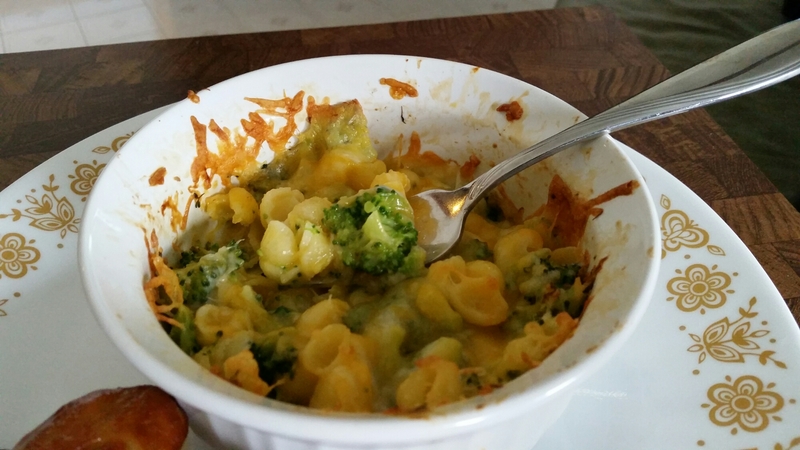 I split the mac into two small casserole dishes, cut up the broccoli into small pieces, added some extra cheese, and then split an egg between the two. Baked for about 10, 15 minutes and had a delicious little lunch on a miserable Saturday afternoon. Anyone else have any quick and easy recipes for meals using your leftovers? PLEASE SHARE!! Happy Saturday and happy cooking!! !